54cm white freestanding cooker is rated 4.4 out of 5 by 24. 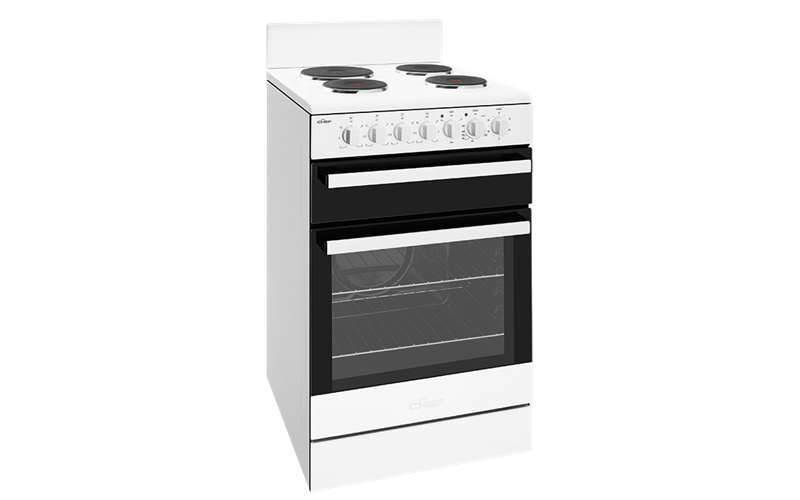 54cm white freestanding cooker with conventional oven, timer, light, separate electric grill and electric hob with 4 solid hotplates. Rated 3 out of 5 by Pisces from Poor choice Had a larger stove with coils for years,these solid hotplates are VERY slow to heat,but when they do the whole top of the stove gets hot to touch.I would not recommend this model for anyone with small children,so small across and the handles of saucepans are over the edge.The grill design is silly, even the technician installing had problems with the rungs,pull too far and the whole lot drop out.The oven temperatures are no where near accurate,3 months on I am still trying different positions and temperatures,things I cooked on 200 burn at 150 on this model,if we could afford it I would ditch it,I WANT MY RUSTY OLD WHIRLPOOL BACK!!! Rated 4 out of 5 by 2017 from Easy to use I bought this last month. It is easy to use and neat in appearance. I have found it easy to keep clean. Still getting used to the hob temperature settings which are fixed (different to my last stove). Grill is small but efficient for a small family. It is difficult to see if a knob is left on so I will place coloured stickers on them. Have left them on by accident a few times unfortunately. The delivery was efficient and the price was excellent value for money. Rated 5 out of 5 by bep39 from Great cooking! I am delighted with my stove, but have one suggestion. The indication on the switches should be shown in colour, say black, so that the position of the switch can be more easily seen. The white bar on the switches can lead to confusion and accidents. Rated 4 out of 5 by Wish52 from A Light.weight stove This stove has very thin walls, top and splashback. It also does not have any lights to tell you that an element is on. It does have an internal light. The griller takes quite a time to heat. Ours was dented on arrival on the left side. Rated 1 out of 5 by Kim B. from The area surrounding the hot plates gets really hot, over 50 degrees. The service man who came to check it indicated that it was fine for it to get up to 80 degrees. Wish I had spent more to get better quality product. Rated 5 out of 5 by Beetle from Easy simple does everything oven/stove Purchase this for a small kitchen it fitted well in the tight space and is very easy to use and clean. A good product that I think will last quite a number of years. Boils faster than gas? Easy. The Induction cooktop provides modern, precise and high speed cooking. Like to know more? Easy.